The U.S. is not on track to achieve the aggressive emissions reductions needed to avoid the worst impacts of climate change. If we ever had the luxury of rejecting some clean energy solutions in favor of others, the time for such selectiveness is now over. To accomplish the enormous and urgent task ahead of us, policymakers, energy companies, project developers, investors, consumers, and climate advocates must push for every available tool to eliminate carbon pollution as quickly and efficiently as possible. Meanwhile, climate action at the federal level seems unlikely for the remainder of the current administration, making state leadership more important than ever. Most states already have taken advantage of one particular policy mechanism to cut carbon in the power sector. Using Renewable Portfolio Standards (RPS), these states require that a certain amount of electricity sold within their borders come from carbon-free renewables like wind and solar. This is a good step in the right direction. However, states could cut emissions more affordably, rapidly, and reliably if their policies extended to a wider set of carbon-free resources. A state could create a Clean Energy Standard (CES) instead of a Renewable Portfolio Standard, which would take advantage of renewables as well as existing and new nuclear, carbon capture and storage, waste-to-energy, and other technologies in its effort to eliminate carbon from the power sector. 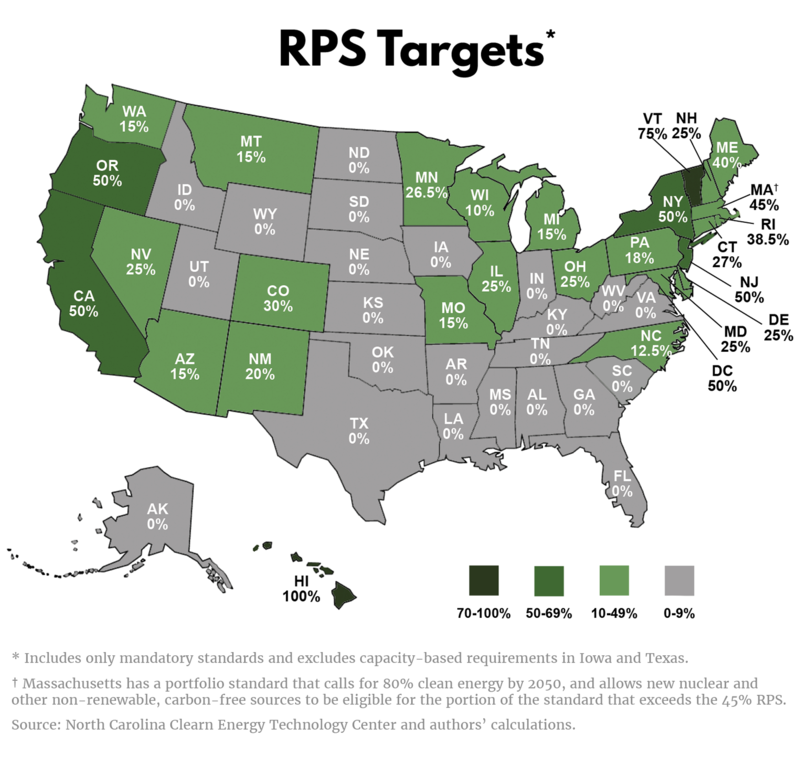 By putting additional clean energy options on the table, most states would be able to set much more ambitious targets for emissions reduction — often doubling their current RPS levels — and some unexpected states could rapidly become new leaders in the fight against climate change. In this report, we summarize the current status of U.S. decarbonization and discuss the role that existing RPS policies play in that effort. We then explain why states should consider a CES instead, using the inclusion of nuclear power plants to illustrate the benefits of a broader portfolio standard. Finally, in a “wonky” appendix, we provide details on how states can design and implement Clean Energy Standards that best meet their needs. To do its part in international efforts to combat climate change, the U.S. should cut its net CO2 emissions by at least 80% by 2050, a goal commonly referred to as “deep decarbonization.”1 Emissions from the U.S. power sector have been ticking down in recent years, but not nearly fast enough to stay on track with climate goals. 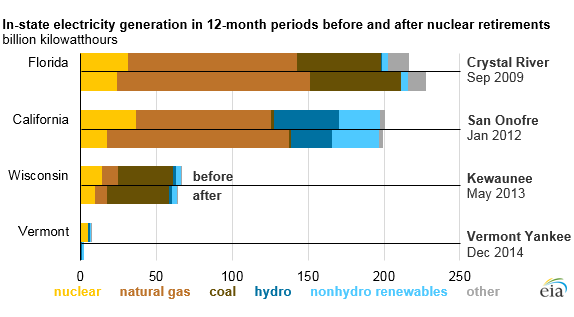 Most of the recent progress on CO2 reduction has been the result of switching from coal-fired power plants to natural gas plants, which produce fewer emissions.2 But there’s only so much more benefit we can squeeze out of this tactic, as U.S. coal plants dwindle. And while they might produce less of it, natural gas plants are still a significant source of CO2. Therefore, eliminating emissions in the power sector will require a massive increase in carbon-free electricity generation to replace fossil fuels — and fast. Unless states take swift action, the Energy Information Administration projects that just 41% of U.S. electricity will come from clean energy sources in 2050, up only slightly from the 37.5% today. But even under relatively optimistic deployment projections, renewables alone are not likely to catch us up to our clean energy and emissions goals. Unless states take swift action, the Energy Information Administration projects that just 41% of U.S. electricity will come from clean energy sources in 2050, up only slightly from the 37.5% today.5 Moving that forecasted 41% of low-carbon electricity to 100% is a central challenge of climate action — and it will require far more effective, ambitious, and far-reaching policy solutions than are currently being employed. One of the most powerful decarbonization policies currently in place at the state level is the portfolio standard. A portfolio standard requires load-serving entities (utilities) to sell a certain percentage of their electricity from a specific type of resource by a certain year. Portfolio standards are most commonly used in the U.S. to promote renewable electricity sources like solar, wind, hydropower, and geothermal. In fact, 27 states and the District of Columbia currently have a binding, share-based Renewable Portfolio Standard (RPS) in place, with an average requirement of 26% renewables and an average target year of 2022.6 Collectively, these policies currently mandate that at least 16% of the total U.S. electricity supply will come from carbon-free renewable resources in the coming years.7 While this would only contribute a fraction of the change needed to fully decarbonize the grid, it suggests that portfolio standards can play an important role in the process. In the absence of a federal mandate for renewable generation, RPS programs are among the most prominent clean energy policies in the U.S. today. Researchers at the Lawrence Berkeley National Laboratory observed that more than 60% of renewables deployment since 2000 has occurred in states with an RPS in place.8Furthermore, studies estimating the costs and benefits of RPS policies have found that the benefits tend to outweigh the costs by significant amounts. For example, a different Berkeley Lab study found that the national costs of RPS compliance in 2013 were approximately $1 billion, while benefits from reduced carbon emissions totaled $2.2 billion and public health benefits came to an impressive $5.2 billion.9 In short, RPS policies appear to foster renewables deployment, their benefits exceed their costs, and, in aggregate, they ensure that at least one-sixth of U.S. electricity will come from renewable sources in the coming decade. There are a number of reasons a state might want to promote renewable electricity, including the development of new industries and opportunities for the local workforce. But if fighting climate change is a major part of the rationale, states would be able to accomplish even more by using portfolio standards to promote a wider range of clean energy tools, including renewables, hydropower, nuclear, and carbon capture. Opting for this kind of technology-inclusive Clean Energy Standard (CES) would allow states to set more ambitious targets for carbon-free power, create a backstop against any future growth of dirty fossil fuels, and expand political support to achieve emissions goals more rapidly. Finally, choosing a broader CES would also provide encouraging signals to emerging carbon-free technologies that there is a market available if or when they become commercially viable. A technology-inclusive #CleanEnergyStandard would allow states to set more ambitious targets for carbon-free power, create a backstop against any future growth of dirty fossil fuels, and expand political support to achieve emissions goals more rapidly. Completely eliminating greenhouse gas emissions from electricity generation is a daunting task. While 27 states and the District of Columbia have set renewable electricity mandates, only one (Hawaii) has raised its target all the way to 100% of power consumption. Most are set at or below 25%.10 That leaves a considerable distance to travel before full decarbonization. Many of these states could help close the gap — and make the idea of a fully decarbonized grid seem a lot less harrowing — simply by acknowledging some of the clean energy tools they’re already using. *Massachusetts allows nuclear plants put in operation after 2010 to contribute to its Clean Energy Standard, thereby excluding the State’s only existing nuclear facility. In Ohio, only advanced nuclear power would be eligible to participate in the Alternative Energy Resource Standard. New York, Illinois, and New Jersey each offers credits for nuclear generation to encourage continued operation of their nuclear plants, but none factor this generation into their mandates. The graph below gives you a sense of just how badly these states are shortchanging themselves. For instance, Minnesota mandates that 26.5% of its power must come from renewables by 2025, leaving nearly three-fourths of the grid in need of transition. By simply adding the percentage of its power that already comes from low-carbon nuclear to its current renewables mandate, Minnesota could rocket forward to a 50% CES. This doesn’t undo any incentives for renewables, mind you. It just lets Minnesota continue its decarbonization efforts from a much stronger position. *Massachusetts has a portfolio standard that calls for 80% clean energy by 2050, and allows new nuclear and other non-renewable, carbon-free sources to be eligible for the portion of the standard that exceeds the 45% RPS. Portfolio standards don’t just help states arrive at a certain percentage of carbon-free power. If they’re well designed, they can help them stay there. Like all infrastructure, power generation equipment eventually reaches the end of its useful life and needs to be retired. With natural gas prices expected to stay low for the foreseeable future, retirement of clean energy capacity over the coming decades will present an unfortunate opportunity for fossil power to increase its market share.13 One great feature of an RPS, though, is that when a solar array or some other resource covered by the standard goes offline, it will have to be replaced by another carbon-free, renewable resource. So no matter how enticing the price of gas is when the time for retirement comes, this portion of the state’s electricity consumption will be off-limits to dirty power. To keep from moving backwards, states can opt for clean energy standards that recognize the contribution of all carbon-free resources, ensure that this total generation sets a “floor” for clean electricity in the state’s power mix, and continue raising the standard toward 100% as rapidly as possible. To have any impact at all, a clean energy policy has to actually get on the books — and stay there. This requires a significant amount of political backing. One thing that can drain public support from even the most well-intended policy is cost. Americans generally believe that government should take steps to reduce emissions, but even ardent supporters lose steam if carbon-cutting efforts add too much to their electric bills.15 So it is crucial to maximize the efficiency (and thereby minimize the cost) of any power sector mandate in order to make it politically viable. There is ample research suggesting that a diverse combination of low-carbon electricity sources, including options like nuclear power, can offer the most efficient and affordable path to drastically cutting emissions in the power sector. Analyses from top U.S. universities and multinational research consortia to the Obama White House support the benefits of this technology-inclusive approach to decarbonization. In fact, the only major studies that have disputed this are the ones that chose to exclude non-renewable technologies from their analyses altogether.16 A Clean Energy Standard would allow a state to take advantage of the most cost-effective combination of technologies needed to hit the target, and thus have a better chance of overcoming the most challenging political hurdle to climate action. Ample research shows that a diverse combination of low-carbon electricity sources, including options like nuclear power, can offer the most efficient and affordable path to drastically cutting emissions in the power sector. 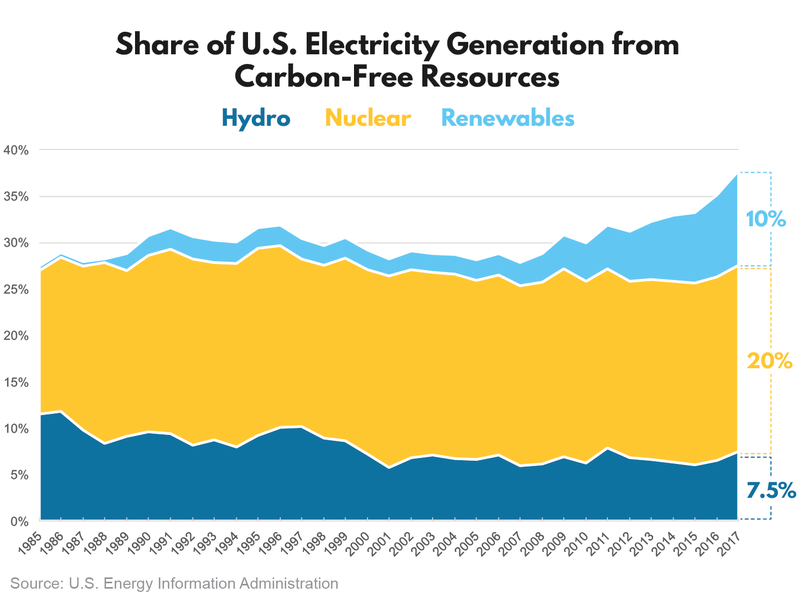 In addition to nuclear plants, there are a number of other non-renewable resources already helping states eliminate greenhouse gas emissions from their power generation, and some could play a much bigger role in the future. Carbon capture and waste-to-energy facilities, for example, are helpful tools that are currently excluded from most state portfolio standards. The Petra Nova facility in Texas became the first power plant in the U.S. to use carbon capture and storage when it came online in 2016. The only other project underway nationwide is the NetPower natural gas demonstration facility, also in Texas. But with a newly-expanded tax credit for carbon storage and use, and continued advancement in capture processes, some states will likely have a growing interest in deploying carbon capture.22 It might prove particularly important for decarbonizing power systems that are heavily reliant on natural gas, where it will be economically and politically challenging to abandon recent investments in gas infrastructure. California, for instance, will likely continue using natural gas as a flexible power source to balance renewable generation for the next several decades. Analysis commissioned by the state suggests that carbon capture for natural gas plants could play an important role in meeting emissions targets.23 New England is similarly reliant on natural gas, and lacks the wide open spaces and strong land-based wind or solar resources enjoyed by other regions. While offshore wind may become a clean energy powerhouse in the region, carbon capture for natural gas plants would make New England’s clean energy goals much easier to achieve. An inclusive portfolio standard could make carbon capture retrofits of existing gas plants a more financially viable option, and give gas-dependent states a tool to address a major emissions source that is currently out of reach. The percentage of a facility’s emissions that get captured can vary depending on how a project is designed.24 Each power plant’s capture rate should be taken into account to ensure it gets credited fairly within a clean energy standard. States should also ensure that fossil fuel plants with carbon capture are still required to meet the strictest emissions standards for all other harmful pollutants. A smartly designed Clean Energy Standard would provide states with maximum flexibility in their paths toward decarbonization. With a CES target stretching decades into the future, a state could lay the foundation for low-carbon technologies that aren’t yet technically or economically viable. That’s why it’s best to form standards around the attributes you want (low-carbon power) instead of requirements for specific technologies. Renewable portfolio standards have proven themselves to be both effective and politically viable as policy solutions to promote carbon-free power and emissions reduction, and they offer states an important opportunity to move forward on climate as Washington largely ignores the issue. However, the rate of decarbonization of the U.S. power grid is still far too slow. If climate leaders want to stay on track toward long-term targets, it’s time to switch gears and move to more aggressive clean energy policies. By pursuing clean energy standards instead of the traditional RPS, states can protect more of the carbon-free energy they already have, set more aggressive goals for clean energy growth, and take advantage of the most efficient and cost-effective combination of technologies to get the job done. For any state looking to take more leadership on climate, a CES should be at the top of the ideas list. Each state Renewable Portfolio Standard is structured slightly differently to account for unique political, economic, and resource considerations. A Clean Energy Standard should be no different. Even within a single state, differences in geography, climate, and industrial activity can all present unique challenges to a clean energy transition. In a CES, a state can tailor the combination of local resources that meets its needs most efficiently. Below are a few factors a state should consider when designing its own CES. There are several key decisions to make when engineering a more inclusive portfolio standard. Most important is the structure that will be used to group and compensate various zero-carbon resources under the standard. Generally speaking, a CES would take one of the following three forms. *The proposal by Commissioner Andy Tobin of the Arizona Corporation Commission would keep the state’s existing 15% RPS in place, but the remainder of the 80% requirement could be met by a wider set of carbon-free resources. Tobin, Andy. “Arizona’s Energy Modernization Plan (ACC).” Arizona Corporation Commission. 30 Jan. 2018, http://www.azcc.gov/commissioners/atobin/letters/energyplan.asp. Accessed 22 June 2018. More efficient: This structure is the most efficient from an economic perspective. A flexible, technology-neutral standard allows all new sources of carbon-free power to compete and requires utilities and retailers to find the cheapest mix of resources to get the job done. Technology-neutral: If a state wanted to ensure that a favored clean energy resource gets deployed, or support a promising but less mature technology that can’t compete against established clean energy sources, it would need complementary policies, like a technology-specific tax credit. Enables more ambitious targets: An expanded list of eligible resources is an opportunity to set more ambitious goals for carbon-free power — it is not a short-cut to meet current targets with existing resources. A unified standard should always be set at a level that requires additional growth of clean energy. A state could also create a multi-tiered CES that partially separates certain resources. In most cases, covered utilities and retailers would only be allowed to use politically-favored renewables, like wind and solar, to meet the requirements of the first tier. In addition, they would need to purchase even more clean power to meet the requirements of a second tier. This second tier could be satisfied using any combination of wind, solar, and a wider set of low-carbon options (existing nuclear, new nuclear, uprated hydroelectric generation, fossil plants with carbon capture, etc.). *While Massachusetts has a nuclear reactor that accounts for 17% of in-state generation and is facing closure due to financial challenges, only resources built after December 31, 2010 can contribute to the clean energy requirements. That means the state’s existing nuclear plant is barred from participating in either tier of the clean energy standard and is scheduled to close in 2019. This kind of major setback could be avoided by designing a standard that counts existing clean energy resources, but sets an even more aggressive overall goal. “Fact Sheet: Electricity Sector Regulations.” Massachusetts Department of Environmental Protection, Executive Office of Energy & Environmental Affairs. Aug. 2017, http://www.massdep.org/BAW/air/3dfs-electricity.pdf. Accessed 22 June 2018. Some competition: The flexibility of the second tier allows a limited amount of competition between resources, the potential minimization of compliance costs, and an opportunity for innovative generation technologies to participate in later years. Choose wisely: Standards created by legislation set a course for years or even decades, and changing that course later requires a heavy political lift. Prescriptive tiers set with today’s information could prove overly restrictive in the future. The more flexible the standard is, the better it will be able to withstand the test of time. * Though it varies by location, the cost of procuring power from existing nuclear facilities is usually less than building new renewables capacity. Robson, Amber. “Preserving America’s Clean Energy Foundation.” Third Way. 8 Dec. 2016, https://www.thirdway.org/report/preserving-americas-clean-energy-foundation. Accessed 22 June 2018. Some states have included efficiency, demand response, and other alternatives to generation to their clean energy standards. This creates several additional layers of complexity, one of which is a risk of crowding-out renewable capacity growth. Bird, Lori and Heeter, Jenny. “Including Alternative Resources in State Renewable Portfolio Standards: Current Design and Implementation Experience.” National Renewable Energy Laboratory. Nov. 2012, https://www.nrel.gov/docs/fy13osti/55979.pdf. Accessed 22 June 2018. Divide and compensate: In some situations, projections show that a particular resource (e.g. existing nuclear) is likely to be consistently cheaper than other clean energy options (e.g., building new renewables or carbon capture infrastructure). In these cases, the overall cost of compliance borne by consumers could be reduced by isolating this lower-cost resource with its own compensation structure.28 If this resource were allowed to compete with all the other resources, it would likely fetch a higher compensation: in a truly competitive market, all resources would earn the same as the price to acquire the last megawatt-hour of clean energy needed to meet the overall standard. Name your price: If a state put existing carbon-free resources such as nuclear plants in a compensation structure by themselves, there might not be enough suppliers to compete with one another, and market forces therefore could not be relied upon to establish a fair price. In this case, the state could minimize subsidy costs by selecting a compensation value that is just large enough to ensure continued operation of these resources. * Nuclear plant owners should be required to open their books to regulators (in a confidential setting) in order to prove their financial need and help establish the requisite payment. Play the long game: This approach can make sense as an immediate solution to preserve the clean energy foundation provided by existing nuclear plants. But there are a number of shortcomings, including the lack of guaranteed replacement with clean energy when credited resources are eventually retired. A more effective long-term strategy should focus on a flexible, technology-neutral standard that allows all sources of carbon-free power to compete, sets the “floor” for clean energy’s share of the power mix as high as possible, and requires utilities and retailers to find the cheapest combination of resources to get the job done. *In the case of Illinois and New York, these payments are also adjusted if average electricity market revenues increase in the future, reducing the needed subsidy and saving consumers money. In the case of New Jersey, state payments can be reduced to account for any subsequent state, federal, or other policies that serve to reward nuclear plants for the same attribute as the state crediting program, thereby avoiding “double-dipping” by plants and limiting taxpayer contributions. See State of New York, Public Service Commission, “The Clean Energy Standard Order,” 1 Aug. 2016. https://www.nyserda.ny.gov/All-Programs/Programs/Clean-Energy-Standard. Accessed 22 June 2018; See also State of Illinois, General Assembly, Public Act 099-0906 (“Future Energy Jobs Act”). https://www2.illinois.gov/sites/ipa/Pages/default.aspx. Accessed 22 June, 2018; See also State of New Jersey, Legislature, S. 2313. http://www.njleg.state.nj.us/2018/Bills/S2500/2313_I1.HTM. Accessed 22 June, 2018. In most cases, utilities and retailers will own resources that generate the power needed to comply with the CES, use contracts to secure this power from resources owned by other entities, or purchase it from wholesale power markets. Most states with a renewable portfolio standard have created new markets or opted in to existing markets that assign and track credits for renewable generation used for RPS compliance. This allows for easier accounting and verification of compliance. It also provides flexibility for covered entities to buy extra credits when needed or sell any credits for generation in excess of their required amounts. To take advantage of this flexibility and efficiency, states should create credit markets for a Clean Energy Standard, tailoring crediting and market regulation to fit the overall structure they’ve chosen for their CES (unified, tiered, or parallel). In some circumstances, policy mechanisms with tradable credits have allowed credit prices to reach very low levels. This can occur when the policy’s targets aren’t set ambitiously enough, causing an oversupply of credits, loss of credit value, and an absence of incentive to deploy clean energy. Credit values can also crash in cases where developers are racing to take advantage of expiring tax incentives or immediately after utilities have met an interim goal. Regardless of the cause, this kind of volatility can deter clean energy investment. Allowing utilities and other covered entities to bank and borrow credits can help smooth prices over time and avoid short-term busts. A state can also set a reasonable “price floor” under which the cost of trading could not fall. Another concern among policymakers is the potential for credit prices to spike under certain conditions, drastically raising the cost of power to businesses and consumers. New Jersey, for example, saw solar RECs surge to over $600 per megawatt-hour from 2008 to 2011, before crashing to just $75 before the end of 2012.30 A well-designed CES could avoid this by setting an upper limit on what covered entities will be required to pay per low-carbon megawatt-hour. Instead of setting a simple cap on trading prices, the ideal mechanism for controlling cost would be an alternative compliance payment (ACP). If the ACP were set at $50, for instance, a covered entity could pay this amount instead of purchasing from the credit market whenever credit prices increased above $50 per megawatt-hour. This essentially sets a cap of $50 per megawatt-hour on compliance costs. States can then use the revenues collected through an ACP to increase investments in clean energy innovation, grid infrastructure, deployment incentives, or other steps to address issues that could be limiting the availability of carbon-free power and adding to the upward pressure on credit prices. UNFCCC. “USA First NDC Submission,” 2015. http://www4.unfccc.int/ndcregistry/PublishedDocuments/United%20States%20of%20America%20First/U.S.A.%20First%20NDC%20Submission.pdf Accessed 1 June 2018. Nordhaus, Ted, et al. “Natural Gas Overwhelmingly Replaces Coal.” Breakthrough Institute, 15 Dec. 2014, https://thebreakthrough.org/index.php/issues/natural-gas/natural-gas-overwhelmingly-replaces-coal. Mobilia, Michael. “Fort Calhoun becomes fifth U.S. nuclear plant to retire in past five years.” EIA: Today in Energy, 23 Mar. 2017. https://www.eia.gov/todayinenergy/detail.php?id=28572&src=email. Accessed 1 June 2018. See also Bloomberg New Energy Finance, “Reactors in the red: financial health of the US nuclear fleet.” Research Note, 7 Jul. 2016. http://docplayer.net/26060517-Reactors-in-the-red-financial-health-of-the-us-nuclear-fleet.html. See also Haratyk, Geoffery. “Early Nuclear Retirements in Deregulated U.S. Markets: Causes, Implications and Policy Options.” MIT CEEPR Working Paper Series, Mar. 2017, http://ceepr.mit.edu/files/papers/2017-009.pdf. U.S. Energy Information Administration. “Electric Power Monthly.” 30 May 2018, https://www.eia.gov/electricity/monthly/epm_table_grapher.php?t=epmt_1_1. Accessed 1 June 2018. U.S. Energy Information Administration. “Annual Energy Outlook 2018, with Projections to 2050.” February 2018, p. 83, https://www.eia.gov/outlooks/aeo/pdf/AEO2018.pdf. Accessed 1 June 2018. This report focuses solely on states with mandatory portfolio standards. It also excludes Iowa and Texas, both of which mandate a specific and relatively minor amount of renewable capacity, as opposed to requiring a percentage of total electricity sales come from eligible resources. See North Carolina Clean Energy Technology Center and authors’ calculations. “Database of State Incentives for Renewables & Efficiency.” DSIRE, http://www.dsireusa.org/. Accessed 1 June 2018. Econometric studies have found mixed results, probably as a result of the difficulty in establishing causal identification in regression models. Barbose, Galen. “U.S. Renewable Portfolio Standards: Overview of Status and Key Trends.” National Summit on RPS, 5 November 2015, Washington, D.C., Conference Presentation. https://www.cesa.org/assets/2015-Files/RPS-Summit/Galen-Barbose-11.5.15.pdf. North Carolina Clean Energy Technology Center and authors’ calculations. “Database of State Incentives for Renewables & Efficiency.” DSIRE, http://www.dsireusa.org/. Accessed 1 June 2018. Walton, Robert. “Update: Arizona Gov. Ducey signs bill to undermine RPS ballot proposal.” Utility Dive, 23 Mar. 2018, https://www.utilitydive.com/news/update-arizona-gov-ducey-signs-bill-to-undermine-rps-ballot-proposal/519880/. Accessed 1 June 2018. Spector, Julian. “Arizona Regulator Proposes Biggest Storage and Clean Energy Target Yet.” Greentech Media, 30 Jan. 2018, https://www.greentechmedia.com/articles/read/arizona-regulator-proposes-sweeping-clean-energy-plan#gs.QjfBMIo. Accessed 1 June 2018. United States, Department of Energy, Energy Information Administration, Annual Energy Outlook 2018, 6 Feb. 2018, https://www.eia.gov/outlooks/aeo/. Accessed 22 June, 2018. Mobilia, Michael. “Fort Calhoun becomes fifth U.S. nuclear plant to retire in past five years.” EIA: Today in Energy, 23 Mar. 2017.https://www.eia.gov/todayinenergy/detail.php?id=28572&src=email. Accessed 1 June 2018. See also Bloomberg New Energy Finance, “Reactors in the red: financial health of the US nuclear fleet.” Research Note, 7 Jul. 2016. Jenkins, Jesse, and Samuel Thernstrom. “Deep Decarbonization of the Electric Power Sector: Insights from the Recent Literature.” Energy Innovation Reform Project, March 2017, http://innovationreform.org/2017/03/01/eirp-deep-decarbonization-literature-review/; See also Williams, J.H., et al. “Pathways to Deep Decarbonization in the United States.” Deep Decarbonization Pathways Project, December 2015, http://deepdecarbonization.org/ddpp-reports/; See also Kriegler, Elmar et al. “The Role of Technology for Achieving Climate Policy Objectives: Overview of the EMF 27 Study on Global Technology and Climate Policy Strategies.” Climatic Change 123.3–4 (2014): 353–367; See also Mileva, A., J. Johnston, J.H. Nelson, and D.M. Kammen. “Power System Balancing for Deep Decarbonization of the Electricity Sector.” Applied Energy 162 (2016): p. 1001–9; See also Safaei, Hossein, and David W Keith. 2015. “How Much Bulk Energy Storage Is Needed to Decarbonize Electricity?” Energy & Environmental Science 8:12 (2015): 3409–17. “State government trifectas.” Ballotpedia, https://ballotpedia.org/State_government_trifectas. Accessed 1 June 2018. Roseland, Christian. “Battle of competing clean energy mandates in Arizona.” PV Magazine USA, 26 Feb. 2018, https://pv-magazine-usa.com/2018/02/26/battle-of-competing-clean-energy-mandates-in-arizona/. Accessed 1 June 2018. Shepherd, Todd. “Arizona Bill Pushes Back Against Tom Steyer-led Ballot Question.” Washington Free Beacon, 15 Mar. 2018. http://freebeacon.com/politics/arizona-bill-pushes-back-against-tom-steyer-led-ballot-question/. Arizona Corporation Commission. “Andy Tobin: Commissioner.” http://www.azcc.gov/commissioners/ATobin/default.html. Accessed 1 June 2018. Modeling done on behalf of the California Air Resources Board to determine pathways to reaching 80% economy-wide emissions reductions from 1990 levels by 2050 showed in all scenarios the ongoing use of natural gas. See Mahone, Amber et al. “California PATHWAYS: GHG Scenario Results.” Energy Environmental Economics, 6 Apr. 2015. http://www.ethree.com/wp-content/uploads/2017/02/E3_PATHWAYS_GHG_Scenarios_Updated_April2015.pdf. Accessed 18 June 2018. Adams, Thomas et al. “Comparison of CO2 Capture Approaches for Fossil-Based Power Generation: Review and Meta-Study.” Processes: 5, 44 (2017). http://www.mdpi.com/2227-9717/5/3/44. Accessed 22 June 2018. “Advancing Sustainable Materials Management: Facts and Figures Report.” United States Environmental Protection Agency. Nov. 2016, https://www.epa.gov/facts-and-figures-about-materials-waste-and-recycling/advancing-sustainable-materials-management. Accessed 22 June 2018; See also “Inventory of U.S. Greenhouse Gas Emissions and Sinks: 1990-2016.” United States Environmental Protection Agency, Chapter 7. 12 Apr. 2018, https://www.epa.gov/sites/production/files/2018-01/documents/2018_complete_report.pdf. Accessed 22 June 2018. “Documentation for Greenhouse Gas Emission and Energy Factors Used in the Waste Reduction Model (WARM).” U.S. Environmental Protection Agency, Office of Resource Conservation and Recovery. February 2016, https://www.epa.gov/sites/production/files/2016-03/documents/warm_v14_background.pdf. Accessed 22 June 2018. State of New York, Public Service Commission, “The Clean Energy Standard Order,” 1 Aug. 2016. https://www.nyserda.ny.gov/All-Programs/Programs/Clean-Energy-Standard. Accessed 22 June 2018; See also State of Illinois, General Assembly, Public Act 099-0906 (“Future Energy Jobs Act”). https://www2.illinois.gov/sites/ipa/Pages/default.aspx. Accessed 22 June, 2018; See also State of New Jersey, Legislature, S. 2313. http://www.njleg.state.nj.us/2018/Bills/S2500/2313_I1.HTM. Accessed 22 June, 2018. Robson, Amber. “Preserving America’s Clean Energy Foundation.” Third Way. 8 Dec. 2016, https://www.thirdway.org/report/preserving-americas-clean-energy-foundation. Accessed 22 June 2018; See also Roth, Michael Buchdahl and Jaramillo, Paulina. “Going nuclear for climate mitigation: An analysis of the cost effectiveness of preserving existing U.S. nuclear power plants as a carbon avoidance strategy.” Carnegie Mellon University, Department of Engineering and Public Policy. July 2017, https://www.sciencedirect.com/science/article/pii/S0360544217307491. Accessed 22 June 2018. “SREC Archives,” New Jersey’s Clean Energy Program. http://njcleanenergy.com/renewable-energy/project-activity-reports/srec-pricing/srec-pricing-archive. Accessed 22 June 2018.